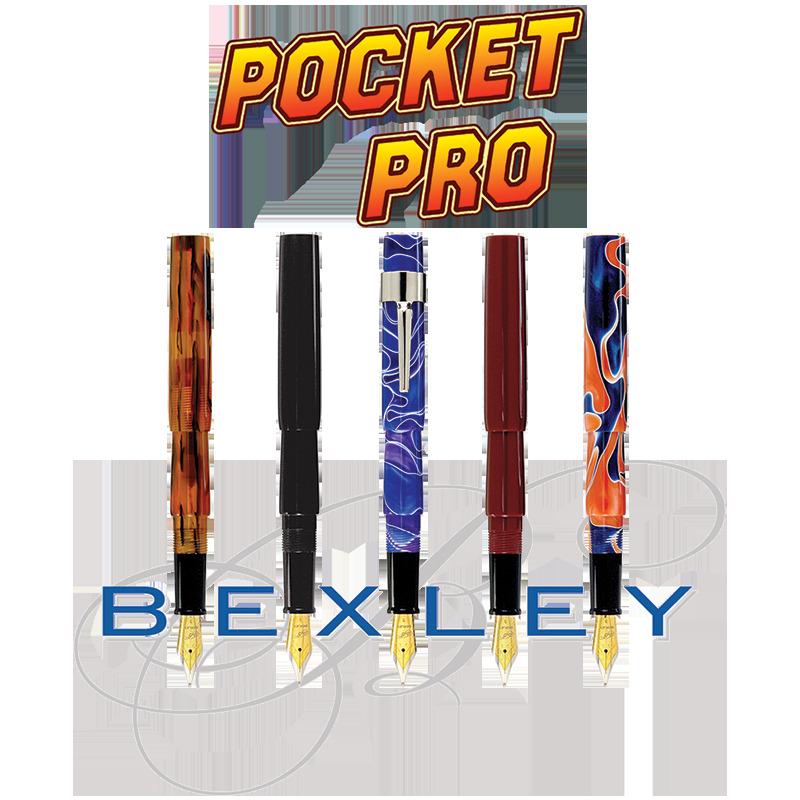 Shirt pocket, pant pocket, or pocket book, it doesn't matter when it comes to the Pocket Pro. 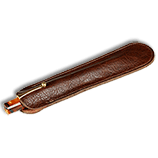 The perfect carry size when you need something small but want a normal size pen when you write. 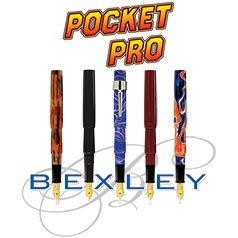 Don't leave home without your Pocket Pro from Bexley. Midnight Candy pen shown with accomodation clip. 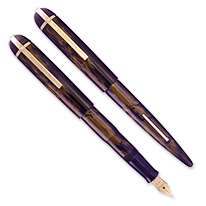 High-quality acrylic resin body made one at a time, not plastic churned out by the thousands from a molding machine, and fitted with top quality German made JoWo nibs in either steel, unbranded 14K Gold (optional upgrade) or unbranded 14K Gold Full Flex - this is a very classy pen for those with discriminating tastes. Use international cartridges of fill from your favorite bottled ink with the included piston converter. 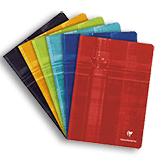 Mandarin yellow is an Indy-Pen-Dance Exclusive! Bexley's gold plated two-tone stainless steel nibs are available in Extra Fine, Fine, Medium and Broad widths. 14K nib options include Fine, Medium, and Broad in unbranded nibs. A custom nib will make your pen unique and a joy to write with. Flex nibs are crafted from unbranded 14K nibs with the keyhole design. First, customer service is excellent, very fast shipping. This pen is beautiful (I got the purple/blue); but like most non-Japanese pens, the XF nib is not especially XF for those who write small. I asked for a moderately wet nib, and I will probably have to use a drier ink than usual, because they delivered a wet nib! The nib is smooth, but not as smooth as perhaps I will soon get it. It's an easy-carry pen, but so lightweight I need to adjust to that a bit. All in all, worth the price, if only because the finish is so beautiful, and shipping is the fastest I've enjoyed from any pen company. I am so pleased with my new Pocket Pro! I use Kaweco Sports daily at work and wanted a nicer resin pocket pen for home use. Water & lava is gorgeous in person -- shimmery indigo and white bordered bright red orange. 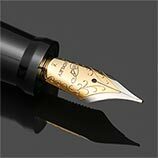 The stock medium nib is a joy to use, nicely wet and silk smooth. I like it so much I just ordered a Stalwart as a larger "companion" pen. Everything about the purchase was fantastic including help choosing the right sac for a project pen. Thank you all, and happy new year!